The 15Watt/3 Amp charger connects to any USB-C device through the hardwired USB-c cable. The charger automatically detects the connected device to allow and deliver optimal charging up to 15 Watts. This means up to 50% faster charging for smartphones* and convenient charging for larger devices such as tablets and Ultrabooks. 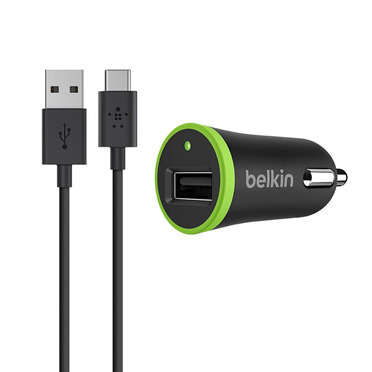 The built-in 4-foot USB-C cable allows you to connect and optimally charge any USB-C device Perfect for in-car charging, the hardwired cable reaches easily from the power source to anywhere in the car, even to passenger seats or hidden power outlets. The sleek, minimalist design matches car interiors. 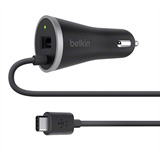 The USB-C car charger with USB-A port and hardwired USB-C cable is protected by a Belkin Connected Equipment Warranty. 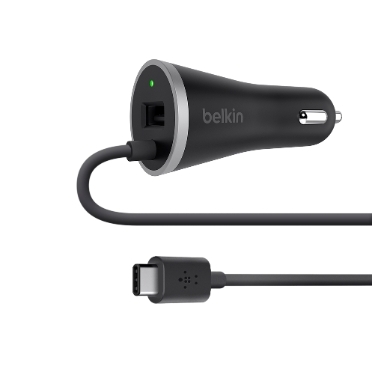 If your device is damaged by an electrical charge while properly connected to the charger, Belkin will repair or replace it up to a value of £1,500.